Located in the quiet suburb of Sans Souci and barely three years old, Foodies Deli Café has always been a favourite with locals. 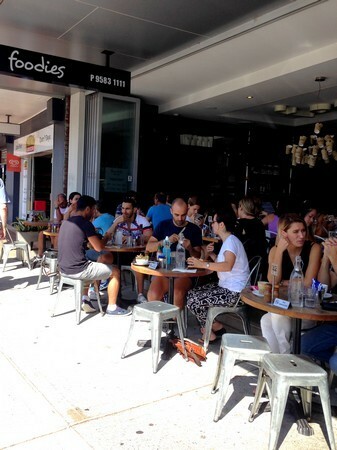 However, since winning best café in Australia in 2012, Foodies’ reputation for great food and excellent service has quickly made it the trendiest little café in Sydney’s south. Foodies is the ideal combination of great food, excellent service with a lively, yet relaxing atmosphere. Finding a table is admittedly a bit of a mission, but thankfully, once you’ve weaved your way through the throng of people and prams, staff will come by and take your order, saving you the arduous trek up to the counter. After placing your order, sit back, enjoy your delicious coffee and perhaps partake in a spot of people watching while awaiting you meal. 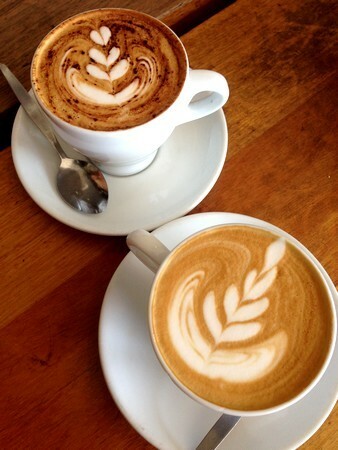 The Di Gabriel coffee, blended and roasted right here in Sydney, is rich, full-bodied and aromatic. Foodies is ripe with colourful characters. Mothers with their barricade of prams sit chatting in the sunshine, while their children craft masterpieces on a chalkboard easel. Gym junkies swoop in and out grabbing a refreshing smoothie after a morning jog and a gorgeous little golden retriever puppy sits happily at his owner’s feet, munching away on a juicy morsel of bacon. When the weather is fine the bifold doors remain open, allowing for some much needed extra seating, and adding a great indoor/outdoor flow. As far as décor, Foodies is a combination of rustic and industrial. The monochromatic colours and exposed brick walls, metallic stools and banquette cushions made of old coffee bean sacks gives the space a very Brooklyn-esqu loft vibe. The look is completed by a whimsically fanciful chandelier made of paper clips and takeaway coffee cups that hangs proudly in the centre of the café. While the atmosphere is always frenetic and the café bursting with people; the food, mercifully, always arrives quickly and with a genuine smile. The staff, who really make your dining experience unique, are all friendly and laid-back, happily chatting to regulars and welcoming newcomers. 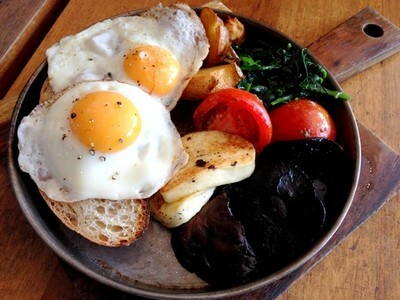 The giant vege pan brekkie, everything one could ever need. While open all day, breakfast is the most popular meal, making Foodies the ideal location for a lazy weekend brunch. The giant pan brekkie ($18.50), which the kitchen churns out all day long, comprises of two eggs, cooked any way you like, bacon, tomato, mushrooms, chorizo and sautéed kipfler potatoes. The pan brekkie’s vegetarian cousin, aptly named, the vege pan ($18.50), is equally as impressive and just as delicious, swapping the protein for grilled haloumi cheese and sautéed spinach. The eggs are perfectly cooked, with the golden yolk cascading over artisan Brasserie bread and the sides, all lightly cooked in butter are delectable. 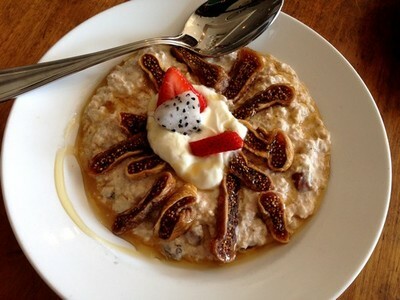 Thick, creamy and delicious - bircher muesli with fig and honey. If fried food in the morning doesn’t really float your boat, Foodies also offers a selection of what they call ‘healthy bits.’ The Farmer Jo bircher muesli ($11) is a definite must have; the muesli is rich and creamy, smothered in honey and dotted with chewy chunks of dried fig, and the Foodies brekkie mix ($14) is the perfect meal for a warm summer’s morning, combining toasted muesli with a summery blend of ripe and juicy fruits, all topped with a dollop of yoghurt and lashings of sweet, amber honey. 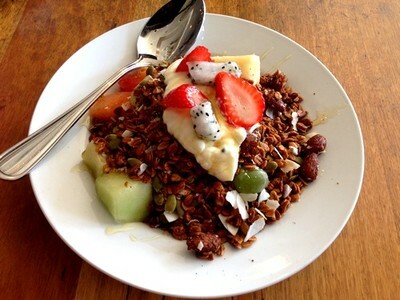 The Foodies brekkie mix - delicious muesli, fresh fruit and yoghurt all smothered in sticky honey. While breakfast is the primary meal at Foodies, the lunchtime offering is not too shabby either. The classic wagyu beef burger ($18) with bacon and Swiss cheese arrives on a wooden board with a steak knife plunged through it. Like all good burgers, this one comes with a giant bowl of crispy, golden fries. 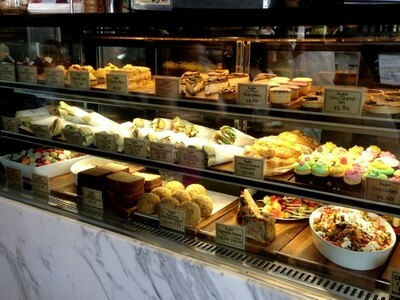 Foodies also boasts a large cabinet, overflowing with sandwiches, salads, croissants and wraps. An array of multi-coloured cupcakes, as expected, draws the attention of every child in the room, and a selection of cakes, tarts and slices are also available, which are tasty, although generic. Foodies also offers a selection of wraps, sandwiches, salads, cakes and tarts which can be eaten in or taken away. 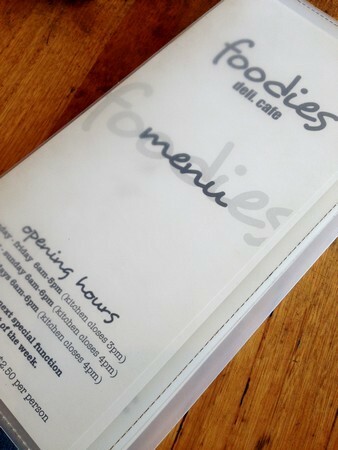 Foodies is certainly deserving of the honorary title bestowed upon it in 2012. The food is fresh and unpretentious. The coffee is exceptional, and the staff, unfathomably, maintain a friendly, relaxed disposition, despite the never-ending stream of customers; and the indoor/outdoor atmosphere strikes the perfect balance between trendy inner-city and mellow beachside calm. Why: Delicious food, great coffee, excellent service, and a great atmosphere. Cost: Breakfast from $5 - $18.50. Lunch from $7 - $18.50. Sweets and cakes from $2.50 - $6.50. When: Open Monday through Friday from 6.30am till 5pm and on weekends from 7am till 6pm. Take away: Cooked meals are not available to take away, but sandwiches, salads, coffee and cakes are.